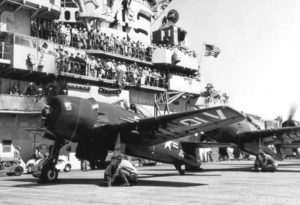 Shortly after 9:30 a.m. on the morning of December 5, 1945, an F8F-1 Bearcat, (Bu. No. 94867), left the Quonset Point Naval Air Station in Rhode Island for a familiarization training flight. About fifteen to twenty minutes later, while at 2,000 feet over the area of North Stonington, the engine suddenly lost all power. The pilot tried to restart the engine but was unsuccessful, and his only option was to make an emergency landing. Seeing an open field, he aimed for it and made a wheels-up landing in an area of North Stonington known as Pendleton Hill. Unfortunately the field was littered with rocks and boulders of various sizes, and upon landing, the aircraft struck some of them causing serious damage to the fuselage and for the aircraft to catch fire. The pilot was able to extricate himself as the plane began to burn, and made his way to a nearby house where he asked to use the telephone.